↑ Toyota Motor Corporation (2015-01-28). TMC Announces Results for December 2015 and CY2015. प्रेस रिलीज़. http://www2.toyota.co.jp/en/news/15/01/0128.html. अन्तिम पहुँच मिति: 2015-05-11. 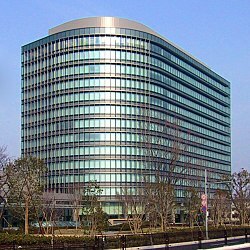 ↑ Toyota Motor Corporation (2013-05-08). Consolidated Results for FY2013 (1 April 2012 through 31 March 2013). प्रेस रिलीज़. http://www.toyota-global.com/investors/financial_result/2013/pdf/q4/summary.pdf. अन्तिम पहुँच मिति: 2013-05-11. ↑ Toyota (2014-03-31). FORM 20-F. प्रेस रिलीज़. http://www.toyota-global.com/investors/ir_library/sec/pdf/20-F_201403_final.pdf. अन्तिम पहुँच मिति: 2014-12-27.